Keep yours going all year. Most of us arrived at January 1st ready to take on 2019 with brand-new resolutions. Our top goal? Self-improvement! 71% of us resolved to diet or eat healthier, 54% wanted to lose weight, 32% decided to spend less and save more, and 26% sought out a new skill or hobby. Unfortunately, statistics show only 46% of us will stick with our resolutions longer than 6 months… Most didn’t even make it past January 12th (so if you’re still sticking with it, you’re already ahead of the game!). So, what goes wrong? It’s usually the same old story: a little thing called life gets in the way. 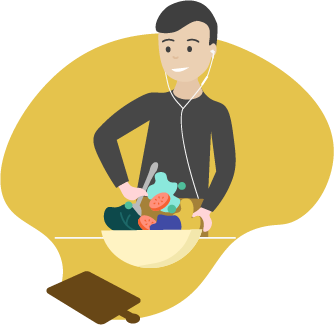 Whether you’re stopping by the vending machine for an unhealthy snack out of convenience instead of packing a lunch, or leaving the office too exhausted to grocery shop–let alone think about that new hobby–it’s undeniably tough to squeeze these fledgling resolutions into a busy lifestyle. We decided to take a look at the common pitfalls that get between people and their goals, and the ways Grown by Freight Farms can be a great solution to help you stick to your resolution (and yes, we’re so stoked about it, we rhymed). Grown by Freight Farms acts as a support system to help make those resolutions stick. 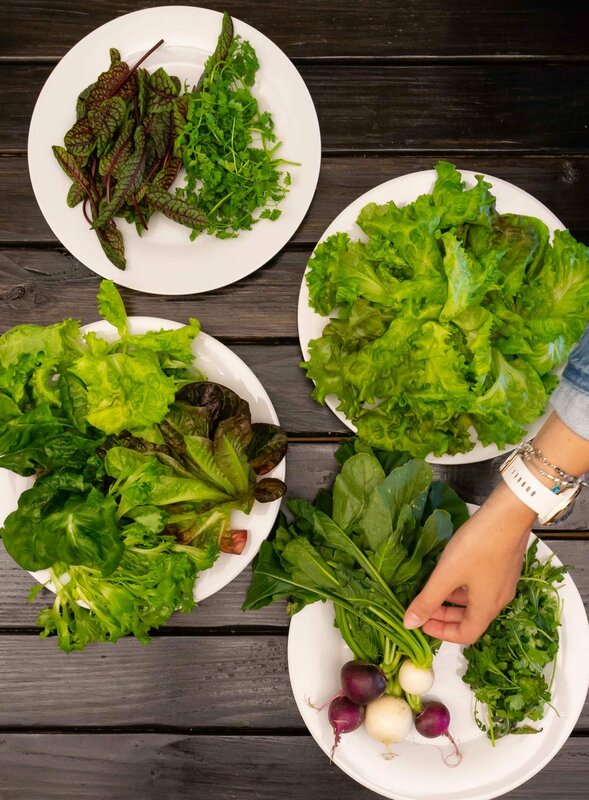 We work with your organization to bring farm-fresh greens directly to the office in the form of an office CSA program. CSA stands for Community Supported Agriculture, and it’s a way to get folks connected to farmers in their area through regular deliveries. Our CSA is unique because we use a vertical indoor farm that we put right by the office. Our farmer harvests the greens there every week and delivers them right to you! Pitfall #1 | You're overwhelmed. When trying to get into the habit of eating well, the myriad of lifestyle changes you need to make can be overwhelming. Then, when you aren’t able to live up to your expectations, you feel discouraged. Cue shame cycle. Grown Solution | Small actionable goals. Instead of trying to completely change the way you eat, focus on replacing a few meals a week with healthier alternatives. A weekly farm share makes it easy to switch out a calorie-heavy sandwich for a filling salad, or substitute delicious sautéed greens for a starch at dinner time. Over time, you’ll see the results add up, and it will encourage you to keep making healthy choices well past the end of January! Pitfall #2 | Your salad is tasteless and joyless. Not all lettuce is created equal. In fact, some lettuces fall very, very, very short of our already not-so-high standards. And when you’re picking brown lettuce out of your pre-packaged salad, it’s really hard to stay excited about a healthy-eating regiment. (Not to mention all those gross E.coli outbreaks). Grown Solution | Vegetables with actual (good) flavor. NEWSFLASH: lettuce is supposed to have flavor! If grown correctly and eaten fresh, it becomes a star in its own right, not just a vehicle for dressing. Since we use indoor farming methods and deliver just hours after harvest, the greens are always fresh and flavorful, even mid-winter. Once you have great tasting, fresh produce in your fridge, you’ll be excited to eat your next healthy meal. Some of our all time favorites are Butterhead (crisp and sweet lettuce), Starbor Kale (it’s actually soft–you can eat it raw without having to chew for five minutes), and summery mint (will last for weeks without losing its amazing fragrance). Learning to play tuba, cross-stitching, or hiking all the 4,000-footers around are amazing hobbies. However, after that first burst of excitement, we tend to lose steam in the kinds of extracurricular activities that don’t fit seamlessly into our busy schedules. In the end, we’re stuck with several half-stitched pillows, twice used boots, and a boatload of guilt. Listen, you gotta eat. The question is, are you reaching for the Chinese take out menu, or whipping up something in the kitchen? Grown by Freight Farms aims to inspire you to choose cooking. By putting high quality ingredients within easy reach, cooking (and eating) becomes highly gratifying. Kitchen staples like chard or parsley can be used in hundreds of recipes, while exotic flavors like wasabi arugula or red-vein sorrel are great for experimenting. Plus, hyper-local produce means the greens stay fresher, longer (read: more opportunities to cook!). Pitfall #4 | Big plans, no time! Once again, that busy schedule is killer. You’re motivated, and committed, and excited, then bam! A surprise 5pm meeting, an oil change, or a delayed train creates a time crunch. The first things to go are the nice-to-haves, like that after work farmers market you were eyeing. Suddenly, you’re eating boxed mac&cheese wondering where your ambitions went. We completely understand: You’re not superhuman and there are only 24 hours in the day. That’s why we based our entire program on convenience. Other CSAs will have you driving across town; we bring the greens directly to your office, so that stocking up on healthy options, and staying on-track of your goals is as easy as walking past reception on your way out the door. Bonus! We all hate wasting money. Yet somehow we put up with tossing half-used bags of salad mix in the trash because it’s gone all goopy. Since we deliver the same day as harvesting, your greens are staying fresh longer, and you end up throwing less away. In this way, Grown by Freight Farms can help you reduce your household’s food waste and save you hundreds of dollars over time. And that’s Grown by Freight Farms! We understand there are a lot more factors involved in keeping up with your New Years resolution. However, Grown is here to combat those small roadblocks that can accumulate and degrade your resolve. What would Grown look like at my office? What’s included in this managed farming service? I’m curious to get even more details! Not sure a CSA is right for your office? We can also integrate with your on-campus cafeteria–learn more here! Everything’s a subscription now… even farming!